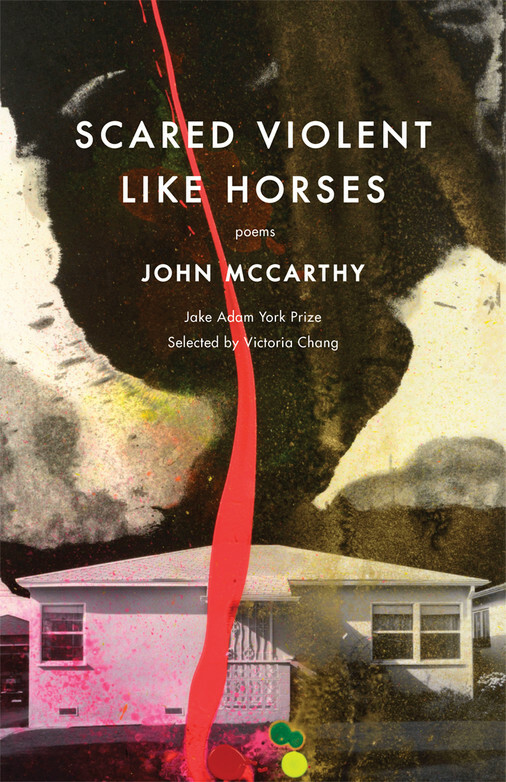 Scared Violent Like Horses by John McCarthy, winner of the Jake Adam York Prize, is a gorgeous lyrical and focused meditation. It reexamines and confronts the past violence of home, specifically the North End of Springfield, Illinois. McCarthy asks us to look at a place’s “soft violence” that “renders and yields this truth—each place is different / in its silence [. . .] It dares you / to misunderstand its rhythm, its landlocked and landmarked song—” He pushes us to look steadfastly at violence as acts of both reclaiming and sensemaking. In “Callousing,” after the speaker is tracked down and beaten by the Johnson farm boys, he states, “Praise this—this memory I rise with all the days of my life. Praise / this—that which breaks only to harden.” In other poems, the speaker recalls his own inclusion in the everyday violence of youthful boredom, “Most of the time, on uneven ground, / we’d throw hooks and haymakers then backpedal scared.” Even here, McCarthy locates the silent truth, “I was never that skilled at slipping punches or finding angles / or pivoting out of the way. I just didn’t want to be alone.” Scared Violent Like Horses never slips a punch—instead it remembers the punches and locates the bruises until the speaker’s jaw is “a healed bone calm enough to speak of violence, to contain its taste.” His title poem reads, “We needed someone to force us / into confronting the uselessness of our violence,” and McCarthy does this, and more, he asks readers not only to confront the past’s violence, but, more importantly, he provides a model for healing and, if possible, praise for what has happened, for where we’re from, and for where we’ve ended up. In J. Chester Johnson’s Auden, the Psalms, and Me, the poet recounts his experience as W.H. Auden’s replacement on the drafting committee for the retranslation of the Book of Psalms, included in the 1979 Book of Common Prayer. Poet Elizabeth A. I. Powell says the collection provides an "understanding of how language and poetry can elevate us spiritually through history, in dark times and light.” Despite wading through weighty discussions⏤not only of the techniques and technical aspects of poetic translation but also of religious translation⏤Johnson never loses his reader. Instead, he balances the technical and the theological with persona, as his voice is all at once knowledgeable, analytical, and poetic. His prose remains delicate, ornate, though still accessible, detailing not only the person of Auden⏤his loyalty to the original translations in the Book of Common Prayer⏤but also his grappling with the past, present, and future. Through Johnson’s lens, we more fully grasp the poet's struggle to reconcile past meanings and modern times. His thorough investigation of the histories of his subjects, the Psalms and Auden, coupled with his own experience on the drafting committee all paint a picture of both Auden and the work of poets as a whole. And so, the book asks readers to step into, immerse themselves in poetic tradition. More than anything, J. Chester Johnson’s Auden, the Psalms, and Me leaves readers with the sense that the work of the poet is never complete⏤to the very end, the poet continues to negotiate the changing times. Rail exists in the between and liminal. It does not seek the easy answer, nor shy away from difficult pasts or uncertain futures. No, it grinds on—praying for many things, but most of all, surviving, asking that you listen closely to the clacking tracks. And it’s safe to say, you probably haven’t heard a survival song like Rail’s before.